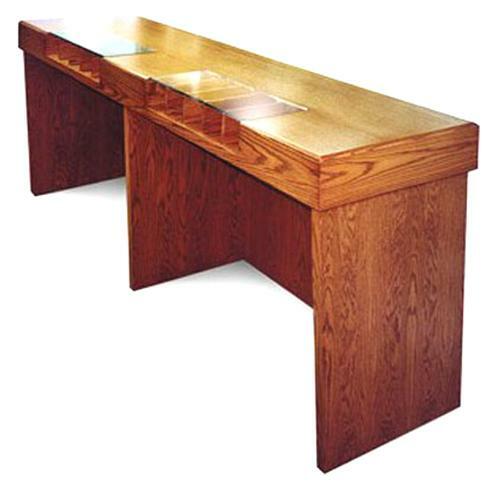 This one-sided check desk, shown in golden oak finish, is ideal for vestibules and locations with limited floor space. It has 10 compartments and a flush-mounted acrylic writing top. Finished on all four sides. Available in a choice of 13 finishes: red mahogany, cherry, golden oak, walnut, light oak, colonial, black, gray, silver, gold, blue marble, green marble and black marble. Dimensions: 42" H x 8 ft. L x 20" D.
This one-sided check desk, shown in golden oak finish, is ideal for vestibules and locations with limited floor space. It has 10 compartments and a flush-mounted acrylic writing top. Finished on all four sides. Available in a choice of 13 finishes.